Kareena Kapoor, Salman Khan and Sohail Khan star in this extra marital comedy Main Aur Mrs. Khanna. Directed by Prem Soni the movie is set to release sometime this summer. This is a love story about a married couple Samir and Raina (Salman Khan and Kareena Kapoor) who face discord in their married life when a club worker (Sohail Khan) falls in love with the wife and subsequently has an affair with her. Further in this twist and turn in their tale, veteran comedian, and new-found friend of Salman Khan, Govinda is expected to appear in the film as a guest actor playing a marriage counselor who tries to help the couple resolve their crises. The film was initially expected to be a re-launch pad for Sohail Khan, but his role has now been reduced and prominence given to Salman Khan. Preity Zinta also plays a special role. 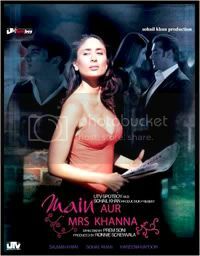 Sajid Wajid are supposed to give the music for Main Aur Mrs. Khanna. Share Preview : Salman’s Main Aur Mrs. Khanna Movie Preview with your friends on Facebook.